Stockholmares know a thing or two about the art of living well, and a large part of this is of course down to their food culture! 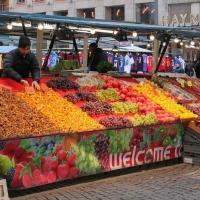 With a penchant for high quality, organic and seasonal produce and a love of gourmet market halls, farmers’ markets and baking, it’s no surprise that eating your way around Stockholm will be a delicious adventure. Experience the warmth, love and tradition of the city's food culture as you visit its bakeries, market halls, coffee shops and foodie neighbourhoods, tasting treats as you go and of course slowing down and indulging in the Swedish tradition of fika! Learn about the city's food culture with your local, tasting traditional dishes and gourmet produce, as well as sipping some local brewed beers, ciders and fruit juices made from seasonal and local ingredients. Visit a beloved local bakery where traditional baking methods and regional ingredients meet new and delicious ideas! Working with flour you may never have heard of like graham, einkorn, buckwheat, and with a love of crispy sourdoughs and hearty rye breads, discover the Swedish baking tradition as you indulge in freshly baked traditional breads, cakes and pastries. 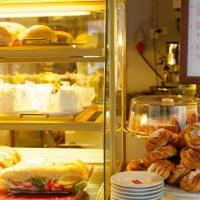 Of course, no foodie experience in Stockholm would be complete without enjoying the beloved Swedish past-time of fika. All about slowing down and savouring time with yourself, your family or friends and enjoying a coffee and cake, your local will take you to one of their favourite coffee shops where you can try a traditional pastry like a cinnamon bun and sip a freshly ground coffee. Many neighbourhoods in Stockholm each have their own farmers’ market where locals buy fresh, organic produce and regional ingredients, homemade preserves, cured meats and local cheeses. Choose whether you’d like to explore one of these markets which most tourists don’t visit, or if you’d prefer to visit one of the city’s iconic market halls, known as saluhallar. On a much grander scale than local markets, these market halls are where you’ll find and taste gourmet delights like pickled herring, smoked salmon, cured meats, local cheeses like Västerbotten, jams made from lingonberry and cloudberry and handmade chocolates. 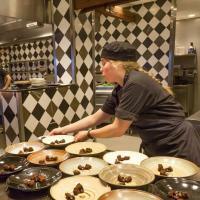 Indulge and taste these specialities, buy some treats to take home with you and learn about Swedish ingredients. Stop by a cafe, bar or even an urban brewery where you can taste a locally brewed beer, cider or a locally pressed fruit juice and learn about the Swedish brewing tradition and the ingredients and techniques used to make crisp ciders and hoppy ales. 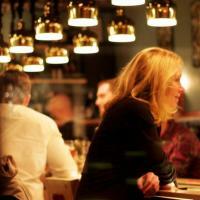 * Join a local foodie to eat and drink your way around Stockholm!